This entry was tagged Andalucía, Axarquía, East of Malaga, Europe, fiestas, life, Malaga, photography, San Juan, Spain, Torre del Mar, travel, Wordless Wednesday. Bookmark the permalink. Beautiful. I thought it was more of an Eastern concept! the beauty and danger of fire! Can I post black and whites? I will be taking some digital but will mostly be developing black and whites. Look forward to somehow being a part and will need to create a blog. They certainly are a bit unpredictable (and uncontrollable). Hahaha … I bet whoever thought of that idea – wished they hadn’t! Still, I guess it must have made for unusual wedding photos, huh? Hi Marianne for my husband Stewarts 60Th birtday we had a garden party with round about 60 people there at the same time we all let one of these lannternes go what a site it was they are very safe if you just whatch what you are doing. I will try and find some photos for my next post. I love them but rarely see them here. 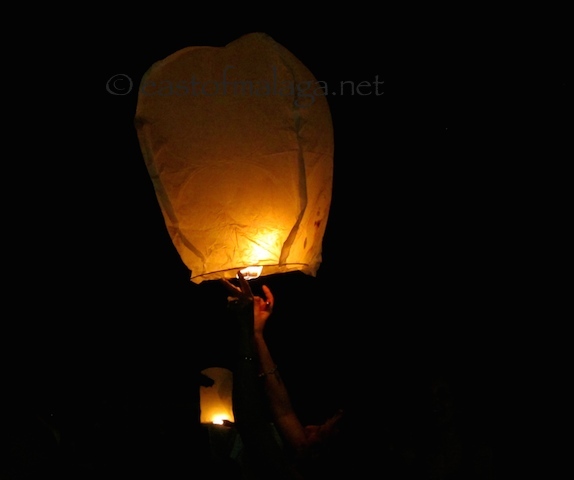 They look lovely when they float away, but sadly, I saw a few being released without such grace – floating sideways with the paper ablaze, towards groups of people all shouting “WATCH OUT”.